Here at Zore’s Towing, our family owned and operated company has proudly served the Central Indiana communities with safe and efficient towing and recovery services at the most competitive prices. Learn why you should choose us for all of your towing and roadside needs! It’s simple; we are your simple, hassle-free solution to affordable towing and recovery services in Indianapolis, and throughout Central Indiana! With more than 90 years in business, you can trust our pledge to provide safe and efficient service at a fair price. Our certified and experienced drivers carry out a wide range of professional towing services, including light to heavy-duty tow truck service, property management, roadside assistance, towed car searches, emergency towing, long-distance towing, heavy equipment transport, and much more. 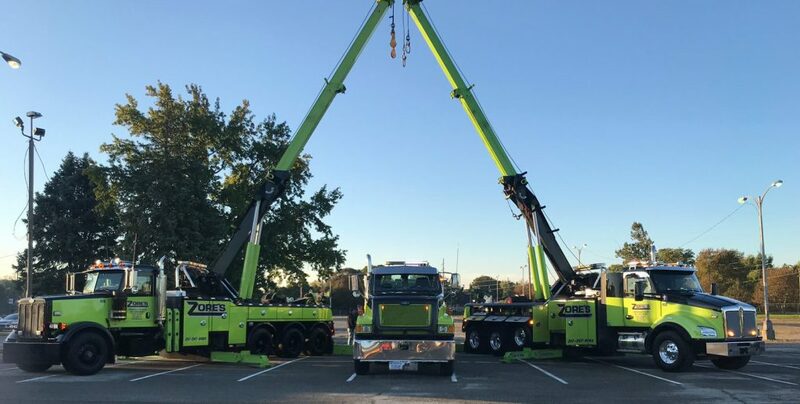 On top of a full fleet of advanced tow trucks and wrecker equipment, we only employ state-certified wrecker operators who work around the clock, providing roadside protection 24 hours a day, 7 days a week, and 365 days a year; even on national holidays! This means that Zore’s Towing is your roadside security team for emergency vehicle assistance at all times. Best of all, all of our tow trucks are radio-dispatched from a live representative, and even equipped with the latest GPS technologies, all of which ensures accuracy and improves response times. As a member of the community ourselves, we are committed to providing the quality and security you come to expect from a local towing service. In fact, we are active in our surrounding neighborhoods in many ways. Not only are we involved with several community services, including city and state training and safety programs, as well as, local community sponsorships and causes throughout Central Indiana, we are also partnered with various fire departments and 9 different law enforcement departments for the purpose of providing traffic incident management (TIM) services, controlled rolls, water recovery, wrecker service, and more. We also work closely with the Hoosier Helper Tool, and have even won prestigious awards for our respected credentials, achievements, and service. Call Zore’s Towing at 317-247-8484, today. On every call, you can expect a prompt hello and a warm greeting from a pleasant company representative who is ready to assist you. Our friendly staff is waiting by the phones, ready to help you get back on the road, safe and sound. Request a free estimate, anytime! This entry was posted in Roadside Assistance, Towing and tagged 24 hour emergency roadside assistance, 24 hour roadside assistance Indianapolis, controlled rolls, Indianapolis wrecker service, traffic incident management (TIM) services, water recovery. Bookmark the permalink.